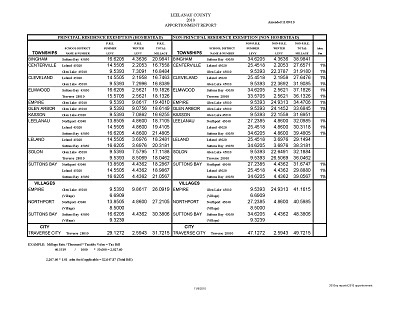 Below is the apportionment chart provided by the Leelanau County Equalization Department showing anticipated 2011 millage rates (this chart was amended November, 2010). This is the chart that is used to figure your estimated 2011 tax bill. In late February 2011 all Leelanau County property owners will be mailed their new notice of assessment informing them of their updated 2011 State Equalized Value and Taxable Value on their property. Have you ever wondered what your property taxes would be if you lived in another township, or if you switched your homestead status to your non-primary home? The chart below is extremely helpful in comparing property taxes in all Leelanau County Townships whether you are in Suttons Bay Township, Leelanau Township, Leland, Bingham, Elmwood etc. You can download the PDF by clicking HERE or on the image below. To figure your estimated tax bill, take your taxable value from your notice of assessment (or approximate house value divided by 2) and multiply it by your township millage rate on the chart divided by 1000 (make sure you have the correct school district and homestead status).